One definition of Theosophy is that it is “the synthesis of religion, philosophy, and science.” The philosophy side of Theosophy is a vital and essential part of it. The word “philosophy” literally means “Love of Wisdom” or “Love of Truth,” wisdom and truth being synonymous in olden times. Spirituality divorced from philosophy is often little more than idiocy, as has been painfully demonstrated by the Spiritualist movement and by the channelled teachings and messages and angel mania that characterise the New Age movement. But whereas such things come and go, the Ancient and Ageless Wisdom ever remains, for it is Timeless Truth and the Truth never changes. 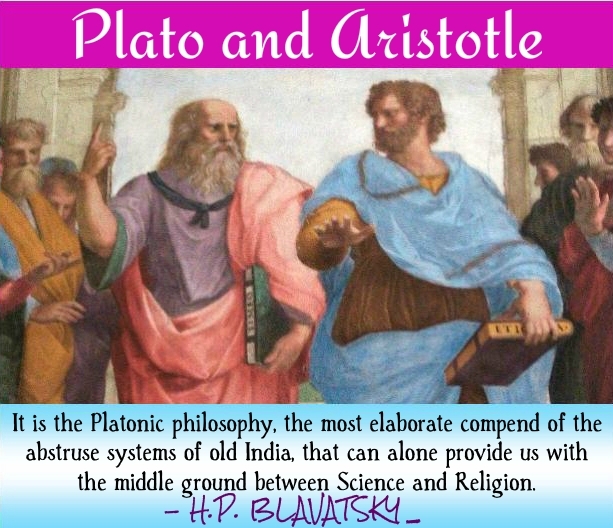 The millennia old conflict and battle of ideas between Platonism and Aristotelianism is expertly summarised and explained in this article and is something which all sincere Theosophists should clearly comprehend and become acquainted with, if they aren’t already. The structural stresses and strains in the philosophy of Aristotle are due to his attempt to subject to critical analysis according to his own theory of knowledge the principles and ideas he had learned from Plato. Aristotle, however, refused to recognize supersensible cognition as the source of knowledge, while the clairvoyant vision of the soul was the only channel to truth, according to Plato. But Aristotle had not this vision; hence his dependence on sense-perception and his elevation of the physical world to the status of reality. While admitting that knowledge must be in terms of concepts, of universals – thus escaping the chaos of mere empiricism – he held that we become aware of universals only by abstracting them from the phenomena of the senses. Thus principles or universals are in things, whether they be regarded as essences or as concepts. It seems almost as though Aristotle devoted his life to the task of showing that he, Aristotle, could point the way to final truth, without being initiated into the Mysteries, and that in order to do this he constructed a theory of knowledge which did not involve initiation as a prerequisite to real knowing. For the eye of wisdom he substituted the eye of sense. Hence he is truly spoken of as the Father of Modern Science. The inductive method, which Aristotle established in the Western world – still slavishly followed by scientific thinkers – is defended on the supposition that it deals with things as they are. Knowledge gained through sense-perception, on which all learning is dependent, according to Aristotle, is therefore more reliable than any a priori concept of an ideal reality. No student of Theosophy would deny the value of reasoning on the basis of many observed particulars. But he would add that this value is lost when the observer is ignorant of the fact that the phenomenal universe is in a constant state of change. How can changing phenomena be properly evaluated unless there is something changeless with which they may be compared? Philosophy, like Physics, must have its “whereon to stand.” As Dr. A. Gordon Melvin observes in his latest book, The New Culture. Every natural body, according to Aristotle, is brought into existence by three principles: Privation, Form, and Matter. Privation, says H.P.B., “meant in the mind of the great philosopher that which the Occultists call the prototypes impressed in the Astral Light – the lowest plane and world of Anima Mundi.” (S.D. I, 59.) Privation is not, however, “considered in Aristotelic philosophy as a principle in the composition of bodies, but as an external property in their production; for the production is a change by which the matter passes from the shape it has not to that which it assumes.” (Isis Unveiled I, 310.) As to Form, “His philosophy teaches that besides the original matter, another principle is necessary to complete the triune nature of every particle, and this is form; an invisible, but still, in an ontological sense of the word, a substantial being, really distinct from matter proper.” (Ibid. I, 312.) This substantial form Aristotle called the soul. True happiness, according to Plato, is found only in the performance of one’s own duty, which is determined individually by the degree of evolution achieved, and politically by the position one occupies in the State. Aristotle disagrees with Plato’s view that individual happiness should be sacrificed for the good of the community. He believes that individual happiness depends not only upon virtue, but also upon wealth, pleasure and the opportunity for leisure. He does not advocate spending those leisure hours in the cultivation of any art, as he considers that artistic craftsmanship belongs to the field of manual labor, and that professional skill in any of the arts is a disgrace to a free citizen. The ideal life, from Aristotle’s point of view, seems to be one which is given over entirely to intellectual research and contemplation – the life of a cultivated and reflective country gentlemen, remote from the workaday world.